KayDee had a long night, eating (again), washing obsessively, moving, not sleeping, eating (again), washing obsessively so that’s the third night in a row for both of us getting hardly any sleep with her being up and down and then eating and then washing, etc., etc. Last night I thought she had died three or four times, no movement for many many minutes (I watched the moon move so I know it was many minutes each time) and then kind of a cough and she’d try to stand up, then fall over. At one point she got up, went to her kitty box and had a nice healthy dump. I was actually annoyed at her trying to fake being ‘healthy’... (sarcasm). So taking her in today for ‘the shot’ was very sad and heartbreaking and at the same time a relief. The sedative had her unconscious in less than a minute. She was so skinny. She slept every night lodged between my neck and my cheek and I fell asleep to her purring, but she never wanted to be held so after the shot was the first time I ever got to hold her to my chest with her head on my shoulder. 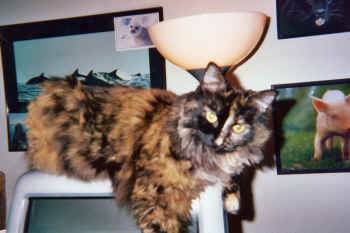 She came into my home as a feral at about one year of age and had a WONDERFUL kitty life with me for 15 years! She was as sweet as she was beautiful. In honor of KayDee, please donate today to a group you trust is doing GREAT work for ALL animals.